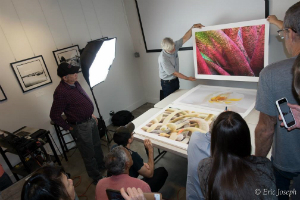 Fine Art Digital Printing Lecture. New York City. This seminar focuses exclusively on improving your fine-art digital printing, primarily referencing inkjet printers. Concentration will be on inkjet printing with color pigments and black/gray ink combinations on coated and rag papers. Learn from the digital pioneer how he obtains his impressive results during this lecture. Discussions will also include an exploration of print esthetics in the digital age – what makes for a beautiful print? - do the new possibilities enhance our notion of what photography can be? - are we merely trying to imitate traditional photographic processes? Papers and their printing problems and advantages will be weighed, as well as their visual qualities.